BookShare is an outreach program that brings children’s picture books and storytimes to young children in child care through their child care providers. Rotating book collections are delivered monthly by volunteers to day care centers, Head Start, and family child care sites. Storytimes are presented at family child care sites by trained volunteers. A goal of the program is to facilitate child care providers reading to young children, therefore services are delivered to child care sites, and no fines or fees are assessed. Research shows that being read to from an early age is an essential factor in helping young children get ready to become readers. Since 1996, it has been BookShare’s mission to help set the foundation of reading and a love of books in young children; to provide their caregivers with reading resources and early literacy training; to encourage parents to read to their young children. Since a large number of children under school age have working parents and spend their weekdays in child care, services must be provided in those settings to reach these children. By involving all of the important adults in the young child’s reading life, early literacy skills develop, love of books grows, and the child’s motivation to learn to read blossoms. The BookShare Program seeks to engage child, caregiver, and parent in the booksharing process. Outreach started small in 1996, serving less than a dozen sites. Today BookShare delivers books to over 1,800 children at 45 child care sites each month. 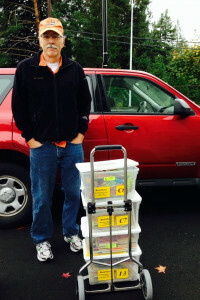 That’s over 3,700 books that travel from our outreach office every month! 1997-1998: The BookShare program was honored by the Oregon State Library as one of the Outstanding Ready to Read Grant Programs, for its innovative book delivery and storytime services to child care providers. 2009-2010:The NorthWest Regional Education Service District recognized the BookShare Program as a “Partner in Education” for its collaborative efforts in supporting the literacy development of young children at Woodside Special Education Preschool. 2009-2010:The Oregon State Library recognizes Outstanding Ready to Read Grant projects that have been particularly effective in achieving the goals of the grant program. Cedar Mill Community Library was recognized for achievement when the BookShare program partnered with Special Education/ Early Intervention to serve children with special needs, and for successful development of a Book Art program to child care providers.